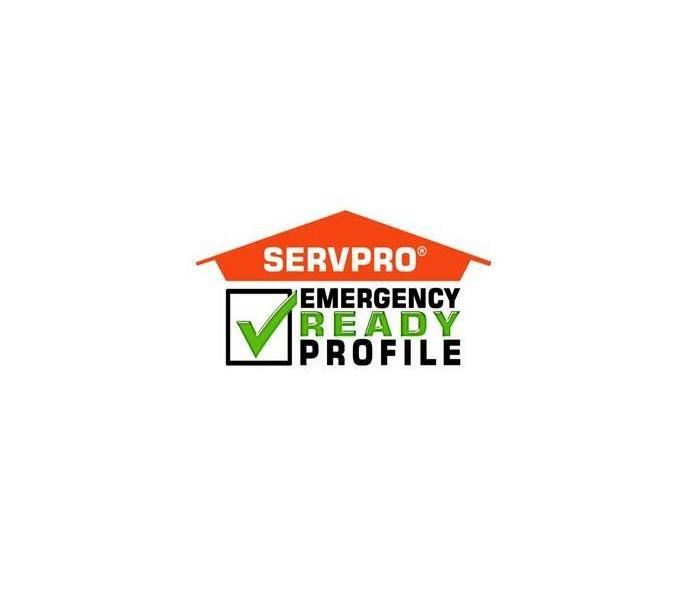 Be “Ready for whatever happens” with the SERVPRO Emergency Ready Program! Northern Wisconsin Ready for Storms? In northern Wisconsin, we can have 70's one day, next day a rainstorm, and the next a winter storm. What I am saying is our weather is very unpredictable this time of year. So with that are your ready for whatever type of storm comes at you? Being prepared is your best defense, you can do this by having emergency numbers handy, knowing where your emergency shut-offs are, having a safe meeting ground for your family, and having appropriate supplies. If you do find your home or business fallen to an emergency storm event have SERVPRO of Hayward as one of your emergency contact numbers as we off emergency board up services, and we are on-call 24 hours a day, 7 days a week, even holidays. Our number is 715-634-0699 for all your storm emergency needs. Grilling this weekend in Burnett County? Grill outside and away from any structures. Make sure your grill is stable. Check for propane leaks on your gas grill. If the flame goes out, wait to re-light. Take care around the grill. Be careful with charcoal starter fluid. Open flame is always a dangerous thing, make sure to keep kids away also. SERVPRO of Hayward wants you to have a safe spring grilling season. Flooding and water emergencies don’t wait for regular business hours and neither do we. SERVPRO of Hayward provides emergency cleaning and restoration services 24 hours a day, 7 days a week—including all holidays. Flooding and water damage is very invasive. Water quickly spreads throughout your home and gets absorbed into floors, walls, furniture, and more. SERVPRO of Hayward arrives quickly and starts the water extraction process almost immediately. This immediate response helps to minimize the damage and the cleaning and restoration costs. SERVPRO of Hayward specializes in the cleanup and restoration of residential and commercial property after a fire, smoke or water damage event. Our staff is highly trained in property damage restoration. From initial and ongoing training at SERVPRO’s corporate training facility to regular IICRC-industry certification, rest assured our staff is equipped with the knowledge to restore your property. Spring storms are you ready? I woke from a dream this early morning, and I was in a nightmare of a tornado. This tornado had chased me down and suddenly I woke up to find it was just a dream. In my dream, my family wasn't prepared and there was no warning. A lot of time we do have great storm warnings and precautions but we always think they aren't common occurrences so why be so prepared. Here are a few things to think about. Have you and your family thought of a safety plan and tried it out? This is first and foremost safety. But further down the road, what if your home or business sustains storm damage, do you have a plan? With your home, having local emergency numbers on hand is a must. In your business you should have this as well, but do you know where your emergency shutoffs are located and/or a plan for your business when it sustains storm damage. At SERVPRO of Hayward we can help you out at both home and your business. We offer emergency board up services 24/7 by calling 715-634-0699. For businesses we offer free of charge Emergency Ready Profile where we will come and walk you through your business and set up a plan in case of an emergency for you. This will help you save time and money in your place of business. If you find any of these services would benefit you please give us a call at 715-634-0699. Water in this basement caused by quick thawing grounds and heavy rain this spring. 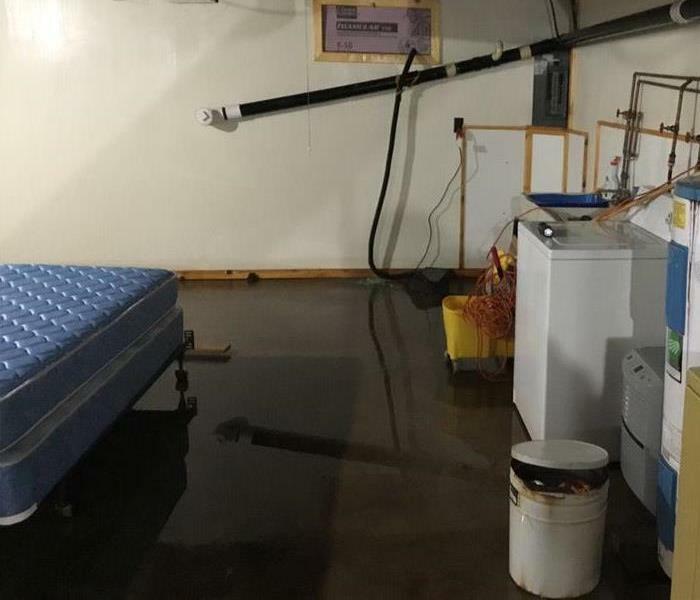 The bottom line: a flooded basement can jeopardize your health, safety, and your home’s integrity. It’s worth making a call to SERVPRO of Hayward and let our trained, professional crews handle the situation safely and correctly. We have earned the trust of hundreds of homeowners, business owners, and property professionals. Sawyer County Businesses Are you Ready? How quickly your company can get back to business after a tornado, fire or flood often depends on the emergency planning done today! While each situation is unique the regular occurrence of natural disasters demonstrates the importance of being prepared. Review the following questions to learn if your company is prepared. -Do you know what you will do in an emergency situation or what kind of emergencies could affect your company? -Do you know which staff, procedures, and equipment are absolutely necessary to keep operating, do you have a backup for those operations. What if your building isn't accessible, or if suppliers are impacted by a disaster? Or utility disruptions. -Do you have an evacuation plan and shelter in place? These are a few of the questions you should ask yourself as a business owner or manager. Let our staff at SERVPRO of Hayward help you develop a plan ahead of time, so you are prepared when an emergency arises. Give us a call at 715-634-0699 to see how we can get an emergency plan in place for you! Recently our Marketing Representative was asked to speak at a job fair at the Hayward, WI Highschool, home of the Hurricanes! She spoke about her personal career with SERVPRO of Hayward, all the services that SERVPRO offers, and also if a career with SERVPRO is right for you! Here is a thank you from the lead of this event. Thank you for speaking to our interested 7th and 8th grades in regards to your career path and SERVPRO. My students and I learned a lot. I found it especially interesting to learn about your procedures from the first call to the project completion. Thanks Again - Mrs. K."
We are extremely proud of Andi for going and speaking of SERVPRO of Hayward so proudly and recognize her efforts in getting the community involved and being involved in it. Just another reason to "Why SERVPRO" because we believe being involved in our local area! Did you know SERVPRO of Hayward trained and certified professionals are available 365 days a year 24 hours a day to help you regain control quickly if you have a house fire emergency? The first 48 hours after fire damage can make the difference between restoring versus replacing your property and personal belongings. We can help prevent fire damage from creating long term problems by providing a timely response with mitigation services ranging from fire, smoke and soot removal to contents claims inventory and document restoration. We will try to ensure your property is restored to preloss condition. Give us a call at 715-634-0699 for SERVPRO of Hayward if you need help recovering after a fire loss. Now, Meet our trained and certified crew members that are ready to help! Although all mold isn't treated equally, you should know what you are dealing with first. At SERVPRO of Hayward, our trained and certified technicians can let you know if you have a harmful mold situation or if you have mold or mildew that you can treat and clean yourself. Regardless please take precautions as if it is a harmful mold. It can cause health issues and can grow and spread very quickly if not cleaned and treated properly. If you have an ongoing moisture problem in your home or business be alert for strong musty odors, which may indicate mold is present. Watch for the presence of visible mold, excessive humidity, and evidence of past moisture problem that might have caused undetected mold growth. If you suspect mold in your home or business give us a call at 715-634-0699. 4/4/2019 - Northern Wisconsin Ready for Storms? 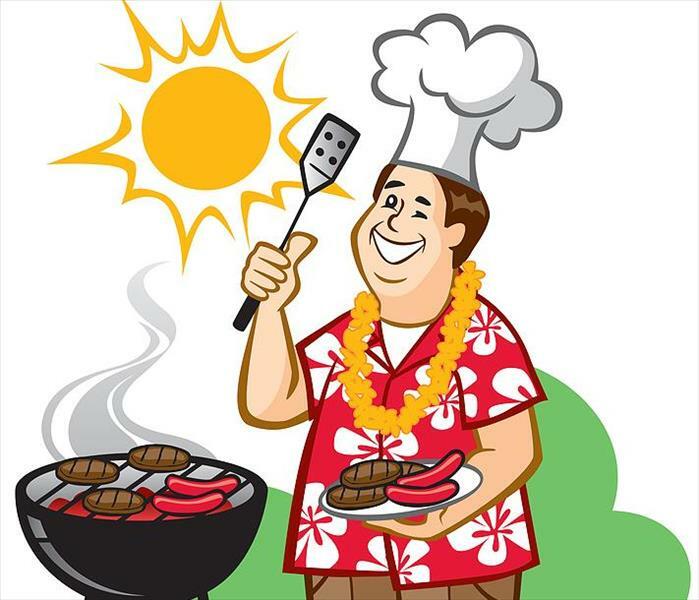 4/4/2019 - Grilling this weekend in Burnett County? 4/3/2019 - Spring storms are you ready? 4/3/2019 - Sawyer County Businesses Are you Ready?